Bored of your usual cereal and toast for breakfast? 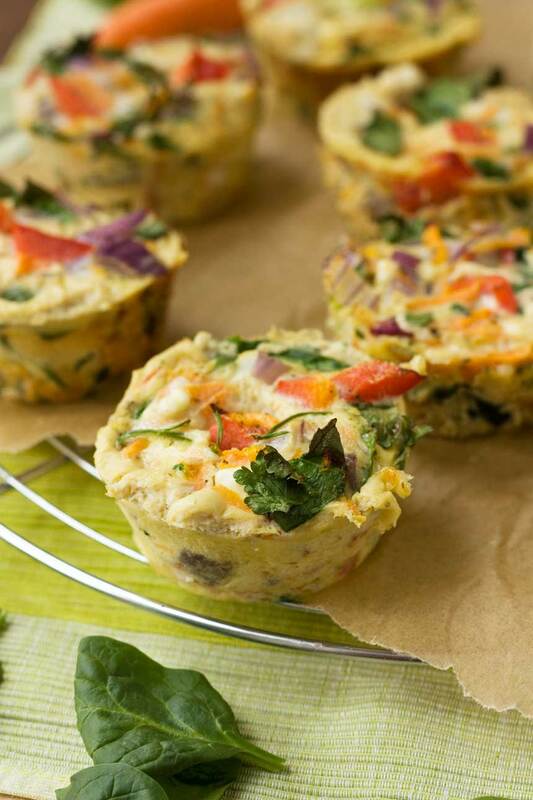 How about grabbing a couple of these gorgeously healthy and colourful veggie muffin frittatas out of the freezer instead? Forgive me if I’ve mentioned this before (about 5 times), but one of my favourite ways of cheering myself up on a Monday morning when I lived in Greece was to pay a little visit to the bakery before work. Believe me, it was hard to feel gloomy with a cup of coffee and a freshly baked ring of bread stuffed with soft feta cheese in front of me. These days, I’m a reformed porridge every morning sort of girl, but last week I had the biggest craving for a warm, cheesy bread ‘something’. In the absence of my beloved Greek bakery, I opted for a ham and emmental croissant. I suppose it wouldn’t be the healthiest breakfast to have every day, either, so this past weekend I made myself these super healthy (but very tasty, nonetheless) veggie muffin frittatas. 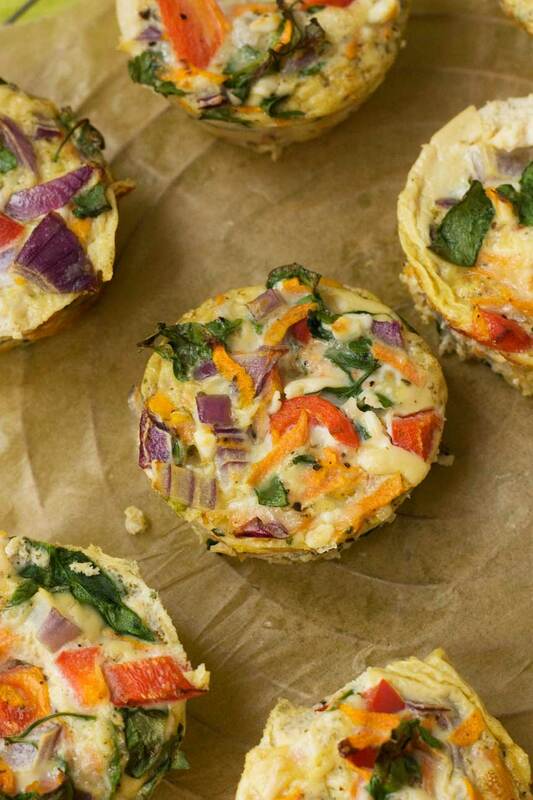 I was going to call these rainbow veggie muffin frittatas. They might not be able to rival a warm ring of bread with feta stuffed inside it, but who can resist rainbow anything? They’re about ten times healthier than bakery treats. They help you use up all the little odds and ends of veggies you have hanging around in your fridge. They take hardly any time to make, once you’ve chopped up said veggies. 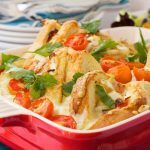 You can freeze them in baking paper, then grab and go for an easy pack-up meal. They make for a pretty good value meal. 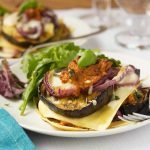 They make for a pretty healthy meal – those veggies are seriously packed in there. They can be breakfast or lunch. Dinner too if you like. I tossed feta through my frittata mixture, of course, but any cheese will work. 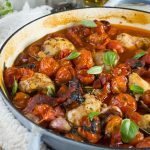 If you liked, you could even add bits of cooked bacon or sausage if you wanted to make them just a tiny bit naughty. How long do you cook these mini frittata for? Just 10 to 12 minutes! For perfect muffin frittatas you want the egg mixture to be set but still slightly wobbly in the middle. And can you freeze them? I grabbed two of these out of the freezer today and took them to work. At lunchtime I popped them in the microwave for a few seconds and ate them with toasted sourdough bread and a big blob of mayonnaise. They were slightly more watery than when fresh, but if you don’t mind that they make a great grab-and-go lunch. And they’re still VERY TASTY, I promise! P.S. If you like this recipe, I think you’ll also enjoy this ‘Everything’ sheet pan frittata. Great for using up odds and ends from the fridge! 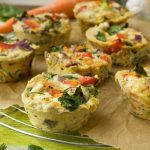 Cute little vegetable and cheese frittatas cooked in a muffin tin are perfect for packing up for a healthy breakfast or lunch on the go. Pre-heat the oven to 190C/375F. 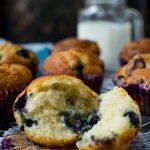 Lightly spray or brush a 12-hole muffin tin with oil. 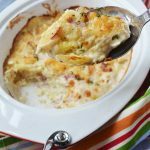 Whisk together the eggs and milk in a large bowl, then stir through all the veggies, herbs and cheese. Grind in a decent amount of pepper and stir again, then spoon the mixture into the muffin holes (not quite right to the top or the egg will spill over!). Bake for 10 to 12 minutes, or until the egg mixture in the 'muffins' is set but still slightly wobbly in the middle. The veggies in this recipe are just a guideline. 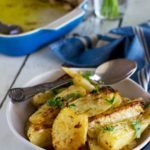 You can use whatever veg you happen to have in your fridge – grated courgette works particularly well (just squeeze out as much of the water as you can once grated). If you decide to use tomatoes, I’d suggest just laying one slice on top of each ‘muffin’. Just don’t stir them through the mixture as they’re a bit too watery. I found it best to half fill each muffin hole with a variety of the veggies and cheese first, then to drizzle in more of the egg until each hole is about 4/5 full. You want about 50% veggies and 50% egg in each muffin hole. A note about freezing - you might find that the frittatas retain a bit of water when you defrost them and reheat. I didn't mind this too much - they are definitely best eaten fresh, but I still enjoy them after they've been frozen! 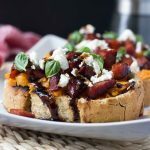 We make a batch of these once a week of quick and easy breakfasts on the go, They save us so much time in the morning. I’m always looking for new breakfast ideas. These are great to make ahead and look so delicious. Thanks, Janette! Glad you like them! I love Greek pastries 🙂 These will be perfect for breakfast, awesome flavors! Can’t wait to try them! 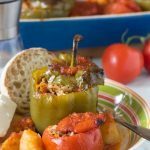 Hi Mira – if you love the flavours in Greek pastries, you’ll love these if you pack them full of lots of spinach and feta. Hope you do try them some time! I love healthy snacks like this! They’re so good to have on hand. Love the fact that they’re full of veggies! Rainbow indeed! The pops of color are just beautiful and just what I want for breakfast! Thanks, Kathleen! I must admit a rainbow theme is perfect for cheering me up on a gloomy Monday morning. I bet these will be ready in a hot minute. 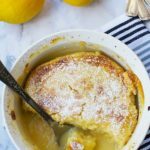 I love having eggs for breakfast, so this is a great idea for busy mornings! Hi Summer – glad you like them! Thanks so much for passing by as well! Yeah, I love being able to grab something yummy from the freezer to eat later. Feels like I’m getting something for free … hahaha! Je crois que je préfère tes frittatas pour le petit déjeuner a un croissante ! Elles sont l’air tellement bonnes ! J’imagine bien mangé celle-ci avec mon café demain matin ! Hi there, just wondering if I could make this in a large version? In a quiche pan or pie dish? Hi Michelle! I don’t see why not! This way, I guess it would be like a frittata. To be honest though I can’t say confidently how long you should cook it for as I haven’t tried the recipe this way yet. I’d guess it would be longer than 12 minutes though. Based on other frittata recipes online, however, I’d try 20 minutes at 350F, then check if it’s cooked. Good luck! I can see how these would make a great breakfast idea. Easy to prepare and colorful tasty as well. Loaded with veggies! 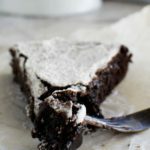 I’m totally going to make these on a weekend for breakfast meal prep!! Thanks, Amanda! They’re perfect for meal prep!